Legrand’s extensive range of cables and accessories encompasses multimedia cables, which are designed to fit into work areas and in spaces where technology-users need access to power and data connections. These cables are compatible with most desktop PCs, laptops, monitors, scanners and printers, as well as gaming consoles and audio and video equipment. According to Legrand SA, HDMI is the most popular audio/visual connection for modern-day consumer electronics. The HDMI signal, which is the digital replacement for analog video standards, carries digital audio and visual resolutions and supports ultra HD. 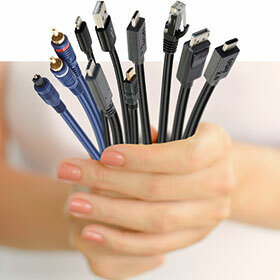 Legrand multimedia cables also include connectors for audio, video and data networks. Audio connectors allow for both analog and digital signals, whilst video connectors are the perfect solution for adding, duplicating or extending a video device. PC connectors make sure a device stays powered and connected to other devices. These connectors adapt with older technology, ensuring all devices work flawlessly. Data connectors are used for Ethernet and Gigabit networks that require fast bandwidth intensive data, or for video distribution applications. Legrand’s comprehensive range of products and systems for electrical and digital building infrastructures has been designed for easy installation, high efficiency and enhanced aesthetics, whether it be an original installation, extension or reconfiguration.